Storage is at a premium if you live in a studio apartment, a loft or a small house. Every inch counts -- including the space under your bed. A homemade platform bed supported by a small bookcase at each end provides storage for books or shoes. Plastic bins slid under the bed platform provide additional storage and are easily hidden by an over-sized bedspread. Use ready-made bookshelves to make your new platform bed in one afternoon. 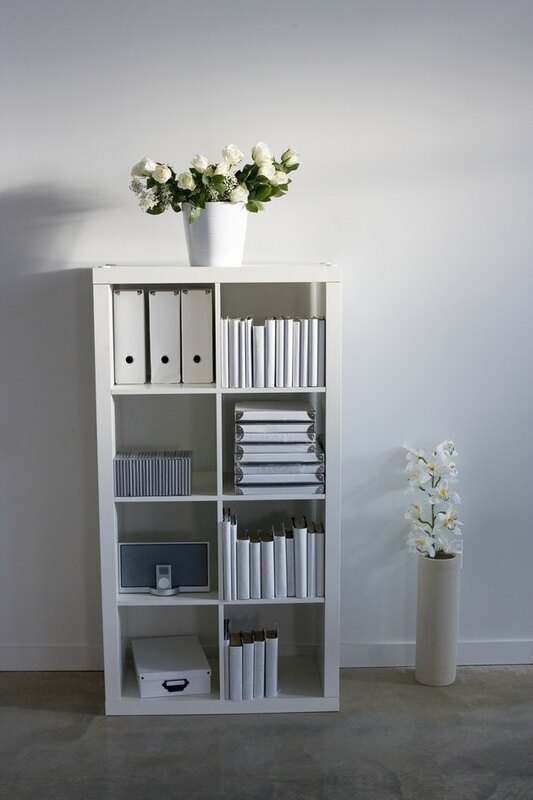 A simple, ready-made bookshelf has many possibilities. Assemble two cube-style, ready-made bookshelves according to the manufacturer's instructions. The shelves should be as close as possible to these dimensions: 17 3/8 inches tall, 72 7/8 inches wide and 15 3/8 inches deep. Lay the two sheets of plywood with the long sides butted together on a flat surface. Center a 74-inch 2-by-4 on edge under the plywood, spanning the two pieces. Place another 2-by-4 at each end, again spanning the plywood pieces, 15 1/2 inches from the top edge and 15 1/2 inches from the bottom edge. Draw a line on top of the plywood, from one side of the bed to the other, along the center and down the length of the middle 2-by-4. Draw a similar line on the plywood over the two other 2-by-4s. Predrill eight holes equidistant along each line, through the plywood and into each 2-by-4s. Attach the plywood to the 2-by-4s with 2-inch screws. Slide a bookshelf under each end of the plywood platform, with the shelves facing out. Adjust each bookshelf so that the front is flush with the edge of the platform. Predrill six holes along the width of the ends of the bed, through the plywood and into the top of each bookshelf. Screw the plywood to the bookshelves using 1 1/2-inch screws. Sand the plywood to a smooth finish, using a fine-grit sandpaper. Wipe with a tack cloth to remove sanding dust. Brush two coats of polyurethane, or a coat of primer and two coats of latex enamel paint, over the plywood. Allow to dry between coats, according to the manufacturer's directions. Place a queen- or California king-size mattress on the platform. A box spring is not necessary.